Ceri has written a review of the recently-released Journey Into Space audiobook, which you can find here. 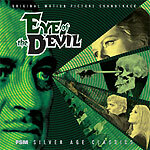 Eye of the Devil, J. Lee Thompson’s 1966 hard-going horror film, has had regular exposure on television in the UK: it's been in regular rotation on the Turner Classic Movies channel (often accompanied by a tantalising contemporaneous promotional featurette, promoting its glittering, ill-fated ingénue Sharon Tate). The film, which has the same basic plot as The Wicker Man, had a rough – some might say cursed – production. Two directors, Sidney J. Furie and Michael Anderson, were assigned to the film before Thompson landed the gig. Eight weeks into filming the film’s unpopular prima donna female lead Kim Novak had a riding accident, and left the film. She was replaced by The Innocents' Deborah Kerr. It’s perhaps fair to say that Eye of the Devil might have ended up as an obscure b-movie, remembered only in film guides and comprehensive studies of the genre, if it hadn’t been for the presence of Sharon Tate (who met and started dating Roman Polanski while making the film). It’s no classic, but it certainly deserves better (it’s not even available on DVD). The film’s score, was the first of two movie scores by Gary McFarland, who had enjoyed a thriving career as a jazz arranger, composer and performer. The score, undoubtedly one of the film’s strongest elements, is something of a tour-de-force, encompassing a wide variety of styles and textures. John Bender’s sleeve notes go as far as to call McFarland’s score “a minor masterpiece”. Its main theme has been recorded many times, under various titles, by various jazz artists over the years. Trading on the composer’s reputation, an album of the film’s soundtrack was originally planned and announced, under the film’s original title, 13. Indeed, an album master was prepared (the new disc’s sleeve notes contain full details), but the disc was never released. FSM’s CD presentation features nearly fifty minutes of the score, which was recorded in England by the National Philharmonic Orchestra, including all the cues intended for the original LP release, taken from the first-generation 35mm three-track stereo masters. The disc also includes a percussion-only track, recorded especially for the film’s trailer. The twenty-page, nicely-designed booklet also features track notes by label boss Lukas Kendall, and includes an account of McFarland’s dramatic death, in November 1971, which ended the composer’s promising film music career. 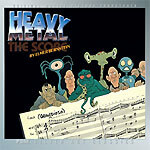 Elmer Bernstein’s majestic score for the 1981 animated science-fiction anthology film Heavy Metal should need no recommendation from me. It’s long been a Holy Grail score for seasoned film music buffs, and anticipation has been festering for many years. Problems licensing the rock songs used in the film meant that fans had to wait until 1996 for a home video version of the film (Sony’s DVD version is excellent, offering a good array of bonus features). Bernstein scored Heavy Metal close on the heels of another science fiction movie, Star Wars, which had done much to reinvigorate the flagging popularity of the symphonic score. Its enormous success had spawned a wave of science-fiction films, all hoping to become the Next Big Thing (among them was ITC’s own effort, Saturn 3, which was also scored by Bernstein). Ironically, it wasn’t Bernstein’s work on Saturn 3 that landed him the Heavy Metal gig: it was his long-standing association with producer Ivan Reitman (they had worked on several films together, including Animal House and Stripes). The resulting symphonic score, performed by the hundred-strong Royal Philharmonic Orchestra, is perhaps Bernstein’s boldest. It is also the score that saw the composer’s first use of what would, somewhat controversially, become his trademark instrument, the ondes Martenot (he used it to great effect a couple of years later, for the sublime Ghostbusters). The disc is accompanied by a twenty-four page illustrated booklet, which features a comprehensive track-by-track analysis of the score, and its use in the film. The back of the booklet, incidentally, offers a more dynamic sleeve image (perhaps one that cannot be more overtly commercially exploited for contractual reasons). 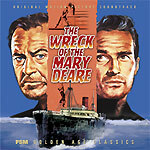 Last month’s Golden Age Classics disc offers two scores for M-G-M courtroom dramas: George Duning’s score for seafaring adventure The Wreck of the Mary Deare (the film based on the book by Hammond Innes); and Johnny Green’s score for the Richard Chamberlain vehicle Twilight of Honor. Duning was a long-term staff composer at Columbia, who worked on The Wreck of the Mary Deare courtesy of its producer, Julian Blaustein (best known, perhaps, for The Day The Earth Stood Still). Blaustein and Duning worked on three movies together, including the excellent James Stewart / Kim Novak thriller Bell Book and Candle. His dark, churning score for Mary Deare, eschewing violins, is accented by a Novachord synthesiser, making it reminiscent of the music for similarly-nautical flavoured TV series Star Trek and Voyage to the Bottom of the Sea. Twilight of Honor was Richard Chamberlain’s first feature film, although he was already a star, from hit TV show Dr Kildare. M-G-M was grooming him for movie stardom, and the starring role, of a fledgling New Mexico attorney, seemed a good fit. Johnny Green (billed as John Green) had a very successful career, including Oscar-winning work adapting the music for Oliver! and West Side Story. He also wrote the stunning score for Raintree Country (also available as a FSM CD). The disc features the complete score for Twilight of Honor, which was scored for an orchestra without strings. Previously only four cues from the film were made available, on the LP released at the time. Both scores are offered in stereo, mixed from the original 35mm three-track scoring sessions. Source cues (some used on the original LP), and a record edit of the film’s Love Theme, are offered as bonus tracks. 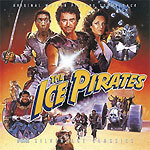 Bruce Broughton’s cheery, boisterous score for The Ice Pirates is another fan favourite, completely outclassing the cheesy 1984 film it accompanies. Broughton was certainly no stranger to the genre, having worked on the TV series Logan’s Run and Buck Rogers in the 25th Century, two more spin-offs following in the wake of Star Wars. The film demanded a big sound, but meagre finances forced Broughton to be especially ingenious. Broughton’s score drops the string section, focussing its attention on a wind ensemble - a common technique in television, where finances are tight – with electric guitar and synth flourishes “for colour”. The film was subjected to some last minute studio re-editing, meaning that Broughton’s meticulously-crafted score was cut and pasted all over the film. FSM’s CD, running for just over an hour, presents the score from the composer’s own quarter-inch stereo masters (the studio’s recordings are lost). Finally, FSM has re-mastered and re-released two scores previously released by Warner Bros Records: Under Fire, a first-rate Jerry Goldsmith album, previously only available in Germany and Japan; and John Williams’ intimate The Accidental Tourist, long deleted on CD. 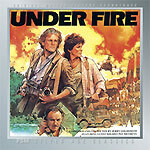 Under Fire is prime, Oscar-nominated Goldsmith, heralding the use of synthesisers as a key, propulsive complement to traditional orchestral scoring. The score also notably features guitar solos by Pat Metheny, and, in a nod to the studio temp-track, liberal use of pan pipes for ethnic flavour (typically, for the always-experimental Goldsmith, these were tailor-made to his specifications, from commercial PVC tubing). The original session recordings for Under Fire could not be located, so the new CD has been re-mastered using the original two-track half-inch album masters. It’s unfortunate that the handful of missing cues remain elusive, but the album is practically perfect without them. It was recorded by Goldsmith’s long-time recording engineer Bruce Botnick, and was specifically designed to showcase the music in a way that would stand alone from the film (thanks to a generous budget from Warner Bros Records). Goldsmith was able to enhance the film recordings with additional percussion overlays, and wrote two tracks especially for the album. The newly-enriched versions worked so well that they were dropped back into the film mix. The disc’s extensive sleeve notes include the original endorsement by director Roger Spottiswoode. 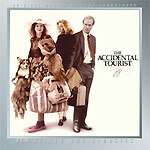 The Accidental Tourist is a modest – albeit Oscar-nominated - work by Williams, perhaps best appreciated by more devoted fans. A late replacement for a score by Bruce Broughton, Williams’ score is something of a throwback to an earlier period of his career, lightly orchestrated, and concentrating on a single bouncy theme. The original album, which is replicated here, is another perfectly-formed gem, missing only a few minutes of the complete score (to compensate, a couple of the album tracks contain music that wasn’t used in the finished film). As with Under Fire, the Accidental Tourist disc has been re-mastered, using the original two-track half-inch album masters. Both albums are highly recommended. It's great to have them back in print, and much more widely available. The Wreck of the Mary Deare / Twilight of Honor, Eye of the Devil and The Ice Pirates are all limited edition pressings of three thousand copies each. Film Score Monthly’s discs are available from specialist soundtrack retailers, including their trading partner Screen Archives Entertainment (SAE). Click on the sleeve images to go to SAE's website, where you will find track lists and downloadable sample tracks.